For nearly half a century, beginning in the early 1880s, vaudeville flourished as the dominant mode of mass entertainment in North America. Vaudeville drew from older popular phenomena like the circus, the sideshow, dime museums, minstrelry, and burlesque, fitting aspects from each into a more modern, streamlined presentation: an assortment of unrelated acts, presented one after the other in short segments of ten or twenty minutes each. Audiences flocked to view an astonishing range of entertainments under one roof: song, dance, comedy, poetic recitation, “playlets” (condensed versions of hit plays), stage magic, “dialect acts” featuring ethnic humor, juggling, trained animals, sword swallowing, acrobats, anatomical freaks, and any number of other eye-popping novelties, peppered with coarse jokes and risqué costumes. In big cities, the major vaudeville houses packed thousands, eventually serving as hubs in continent-spanning circuits of theaters; in the sticks, vaudeville bills might run at smaller venues like local "Opera Houses" and Grange Halls. Though often seen as a decidedly lowbrow pleasure—despite attempts by producers to clean up its image—vaudeville’s something-for-everyone programming attracted huge audiences of both men and women from all walks of life, particularly members of the growing American middle class. 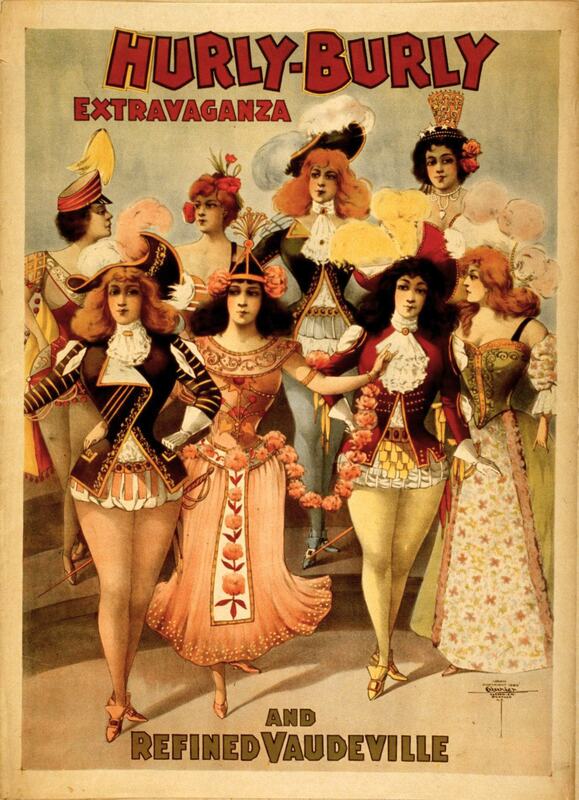 By the fin de siècle, the more prominent vaudeville venues had begun incorporating early motion pictures into their repertoires, alongside other visual spectacles like magic lantern shows, “illustrated songs” using painted slides, and tableaux vivants presented by actors. This started in 1896, when Edison premiered his Vitascope at Koster and Bial’s on 14th Street in Manhattan, and a couple months later, the Lumieres’ Cinematograph made its American debut at Keith’s Union Square. Thereafter, vaudeville programmers regularly scheduled films as single “acts” on daily bills, and soon could not leave movies out of their lineups without fear of competition. Vaudeville thus introduced cinema to a truly mass audience, insuring this new technical innovation’s future as the center of show business. The ascendence of cinema would eventually bring vaudeville’s doom. Vaudeville began losing ticket sales to the nickelodeons in the 1910s, but continued to compete well with the movies into the 1920s. The coming of talkies abolished the last advantage vaudeville still held over the cinema—dialog and song—and seasoned vaudevillians like Eddie Cantor, W.C. Fields, Mae West, and the Marx Brothers abandoned back-breaking schedules of daily performances in favor of better hours and sunnier climes in Hollywood. Lavish variety houses were converted into movie palaces, and former vaudeville producers became the heads of new movie studios. For this evening’s presentation, film archivist and historian Dennis Nyback has painstakingly collected and assembled 16mm reduction prints of motion pictures from 1925 to the late 1930s that document and preserve some of vaudeville’s most notable performers during its later years. His lineup ranges from an early sound test film of Gus Visser and His Singing Duck to rare filmed bits by African-American vaudevillians in the days of the segregated “chitlin’ circuit” of variety theaters. In its own embrace of continuous miscellany, Nyback’s program evokes a steady flow of spectacle that is distinctly vaudevillian. It also tells the story of a moment of technological transformation in popular culture, as the business of live theater gave way to an industrialized model of centralized recording and distributed exhibition; moreover, it shows how cinema’s origins lie not merely in the camera obscura and the zoopraxiscope, but also in the baggy-pants comedian and the smart-mouthed showgirl. The L.I.M.E Trio, "The Golliwog Undescribable"